Teaching myself one new knit stitch a week, from the Complete Guide to Needlework book, c. 1979. 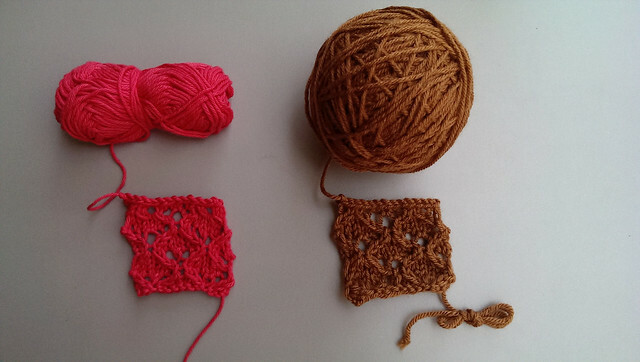 I cast on 14 stitches on size 9 needles in a pink yarn from my stash (left) and Vanna's Choice in Toffee (right). 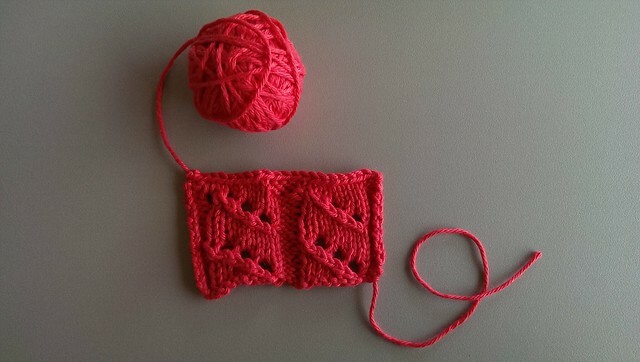 It's a pretty nice stitch - and I was surprised I kept up with all the directions! I like the way it stitched up best in that brown acrylic. I bet it would be really nice on a sweater. The pearl cotton gave it a nubbly texture, but I really liked it - it's almost like fish scales. It's a lot faster to work than satin stitch or the raised herringbone stitch I learned last week, and it eats up a lot less thread. I love how the crewel wool sort of floats and expands above the fabric - it's a totally different effect! 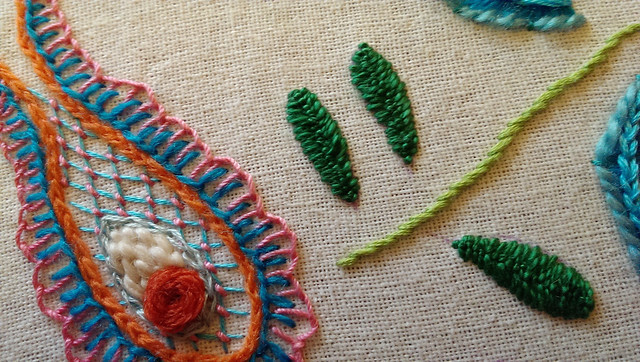 So, I took a brief break from the Complete Guide to Needlework because I saw the Seafoam stitch and fell in love. I love those wonderful Eye of Horus-like textures it creates when you go back and forth between Garter stitch and multiple yarnovers. Up above, I cast on 21 stitches on size 6 needles and used this pattern - the blue is a bulky yarn in my stash and the other yarn is Knit Picks Wool of the Andes in Thyme. 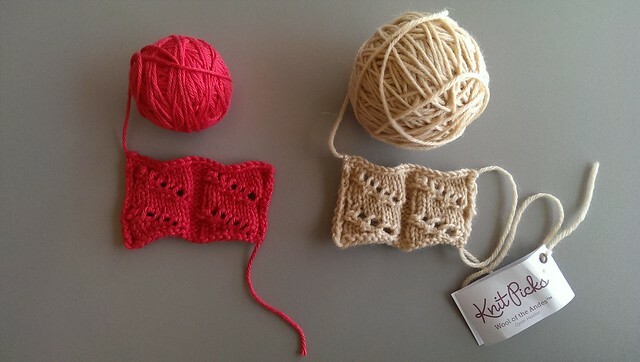 I like these two yarns best for this stitch - I think it's better to have a tighter structure. 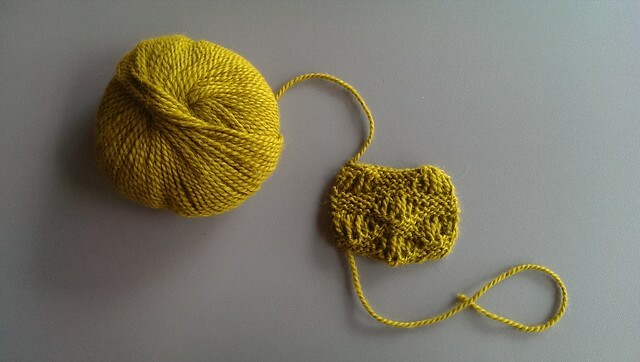 I like the color, and the airiness of them, but I prefer the look of the bulkier yarns on this stitch. Here's the back of the stitch - it sort of hangs out all over the place. What do you guys think? 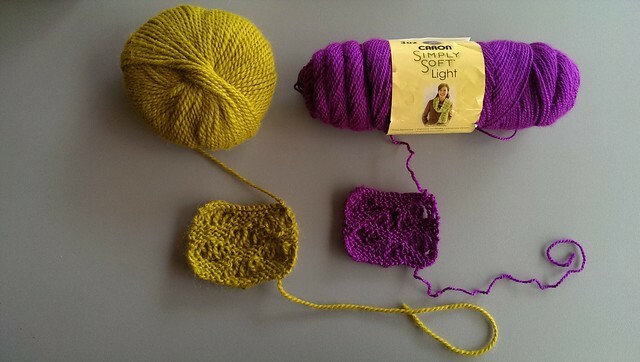 Have you ever tried this stitch? It's super easy and fun to work! I am having so much fun with this project now! Here I am working some leaves, this time in a DMC pearl cotton - I love the raised texture this stitch gives the leaves. 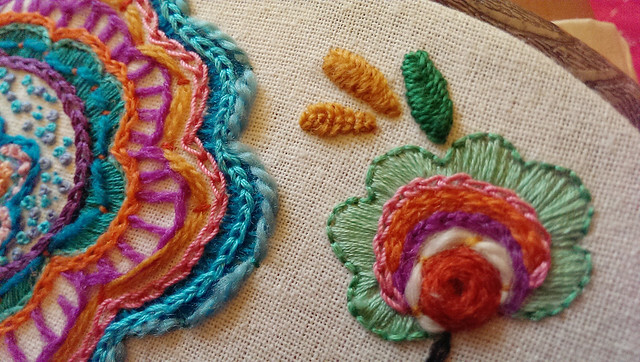 I used this tutorial on Pinterest to form this stitch - I never execute it perfectly, the leaves always tend to lean to one side or another, but I think that gives it an organic look. 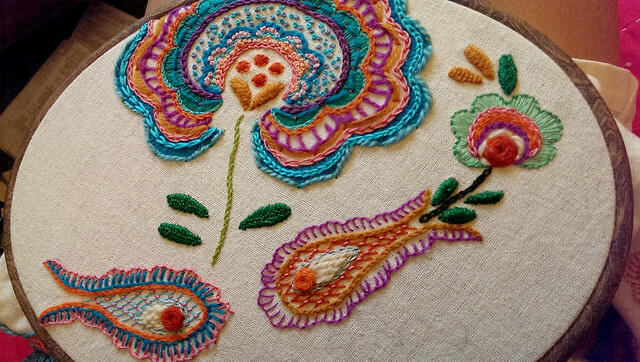 Stitching Saturday: Crewel is magic! 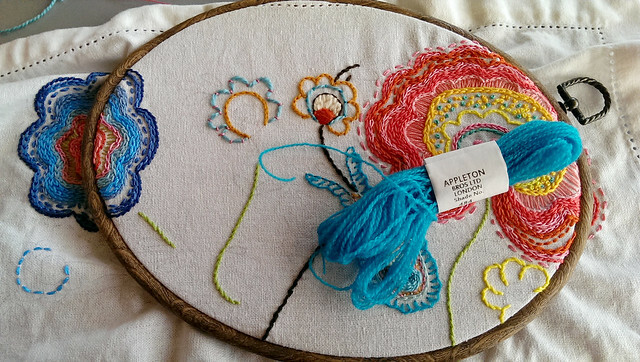 Stitching with wool for the first time last week was a total eye-opener for me. Crewel wool is perfect for larger works - it moves differently, sits differently on the fabric, it has an extra springiness and a visible texture. It makes a much stronger, bolder line, and is so nice to work with. 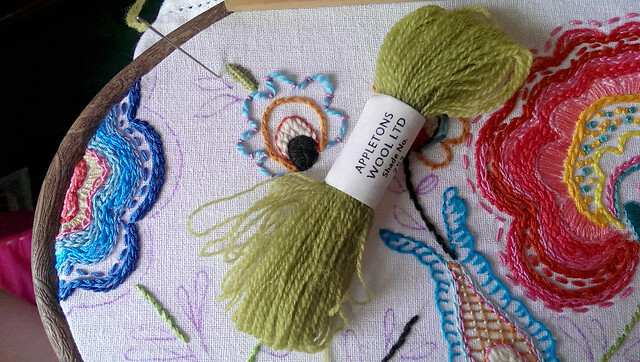 I can't believe I'd never used crewel wool before, and it has already added so much to my stitching. I had a pillow project I'd stashed away - I loved the pattern, and all the bright colors I'd chosen for it. I'd already done some really dense stitching that I'd totally enjoyed, but then my enthusiasm just burned out. I looked at the large expanse of remaining shapes and practically groaned. 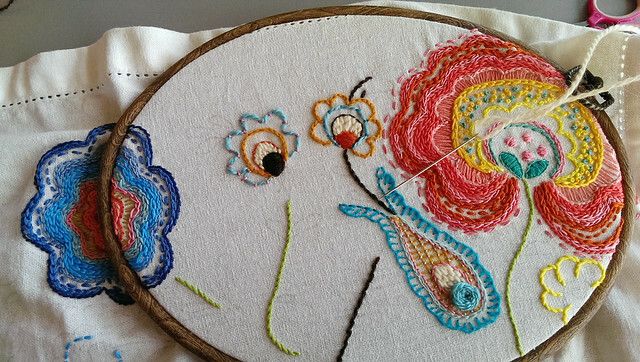 I imagined myself separating out 2 strands of floss for each line, and painstakingly stitching away, forever. 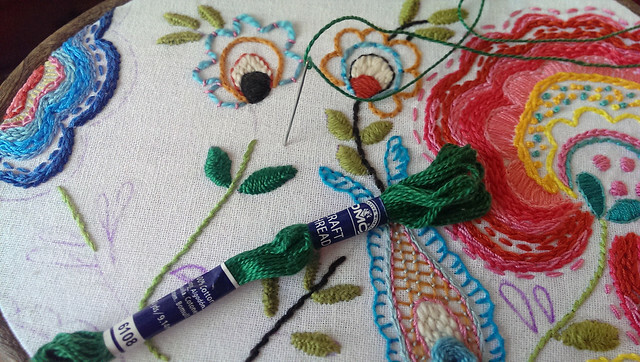 But again, crewel wool and traditional filling stitches were designed to fill up large spaces quickly - and I'm loving that long and short stitch with a thick, plush white wool. I used a buttonhole stitch to trace the edges of that teal paisley shape, and again I said, "well, duh" - it hugged each curve so perfectly when stitched with crewel wool - no more dividing lots of strands, and fussing as they get caught and tangled up with each other - even when I double up the crewel wool, it pulls through linen like a dream. 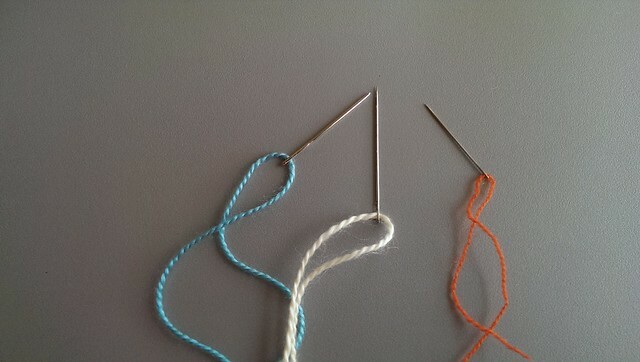 I keep a lot of needles on hand as I stitch with the different weight fibers - large dull-tipped darning needles with big eyes for thick yarn (left), a long yarn darner with a sharp point for more detailed stitches (center), and a regular sharp crewel needle for the crewel wool (right). In short, I am in love with crewel - I'm glad I added so much dense texture in the embroidery floss at first, and I'll build on that with all the matte, textured shapes I'll stitch in wool. Yay for crewel wool! Teaching myself one new knit stitch a week, from the Complete Guide to Needlework book, c. 1979. First, my mess up version - I cast on 23 stitches, this time on much smaller needles - size 6, using a pink yarn from my stash and Wool of the Andes in Oyster Heather. This was a complicated one, and I messed it up. I think I didn't execute the yarnovers and PSSO's like I was supposed to - they look wonky, although they're consistently wonky. Depending on my desire for prefection, I might try this again... Re-worked below! 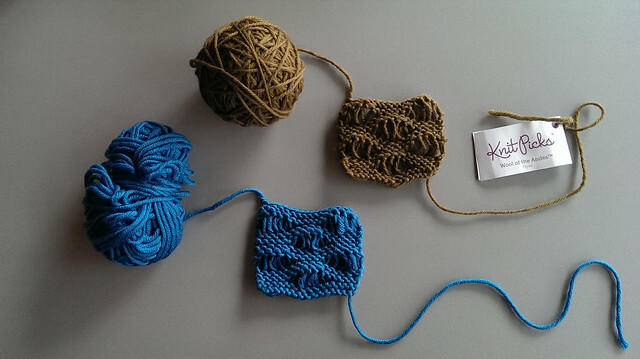 I wasn't working the p2 tog tbl correctly, and I was also moving my yarn to the wrong side before my sl 1, k1, psso - once I got that right, I got it.